The purpose of this book is to help Canadian business owners, senior executives and employees put their thoughts and processes together and submit successful applications for funding, including government grants and loans, bank, private and non-traditional financing. 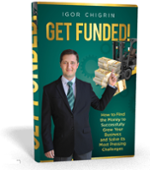 This book is based on the author’s and contributors’ years of experience successfully getting financing for Canadian businesses and non-profit organizations. Little-known details about term loans, lines of credits, mortgages, government grants, tax credits, customs duty drawback, angel & venture capital funding, leasing, asset-based lending, factoring and much more.